Die NOE ist ein Design von Berckemeyer vom Typ BM 39 Bristol. Das Aluminium Chassis wurde von der Yachtwerft Benjamins im Jahre 2008 erbaut. Der Innenausbau erfolgte danach in der Bootswerft Borssum in Emden. Wir haben das Boot 2012 gebraucht gekauft. Bei dem Boot handelt es sich um eine Deckshausyacht mit einer LÜA von etwa 14m und einer Breite von 4m. Der Rumpf ist komplett aus Aluminium gebaut und 11,63m lang. Das Boot ist mit einem Hubkiel versehen und gibt dem Boot einen variablen Tiefgang von 1,20m bis 2,90m. Zur Ausrüstung des Bootes gehören unter anderem eine Doppelruderanlage, ein Bugstrahlruder, Großsegel, Genua, eine Selbstwendefock, Radio mit DSC und aktivem AIS, Plotter E80 und Autopilot von Raymarine und eine Solar- und Windanlage. Als Sicherheitsausrüstung ist eine Rettungsinsel und ein EPIRB vorhanden. Die Verdrängung des Bootes ist 14 Tonnen. Da das Boot einen aktiven AIS Sender hat, kann unsere Route und Position getrackt werden. NOE was designed by Berckemeyer from the typ BM 39 Bristol. The chassis is made of aluminium and was built 2008 by the yacht yard Benjamins. The interior was installed by the yacht yard Borssum in Emden. We bought the boat in 2012 second hand. 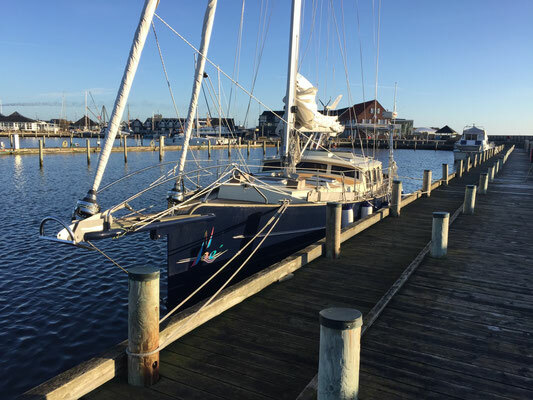 The boat has a deck house and has an overall length of almost 14 m and a width of 4 m . The hull is completely made out of aluminium and has a lenght of 11.63 m. The draft varies from 1.10 to 2.90 m, as the boat is equipped with a lift keel. 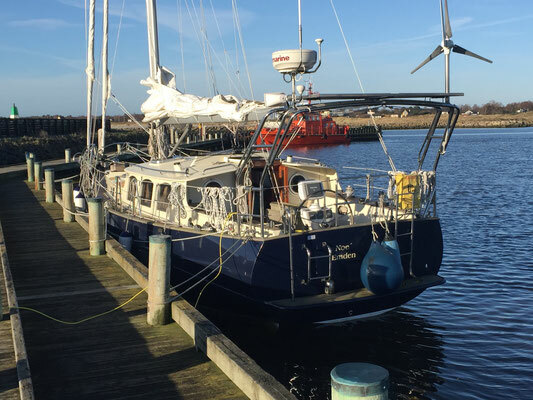 Furthermore the boat has a double rudder, a bow thruster and in addition to the main sail and the genua a self-tacking jib. On board there is a radio with DSC controller, an AIS activ system, a plotter E80, and an autopilot from Raymarine, solar panels and a wind generator. The displacement of the boat is 14 tons. A life raft and a EPIRB are on board for safety. As the boat is equipped with an active AIS transmitter, you can check our position online.